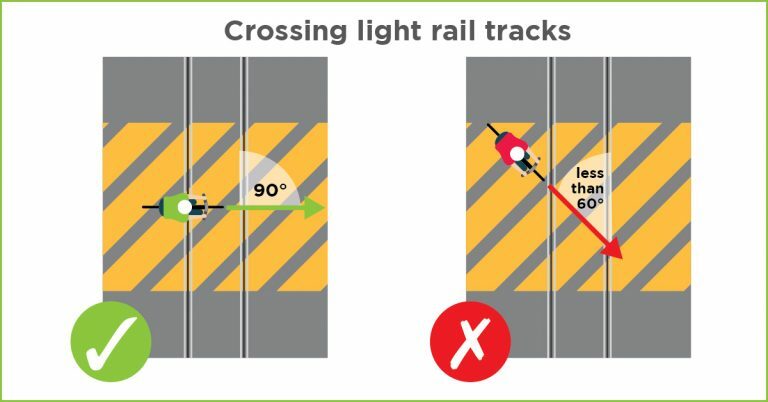 As light rail projects are completed in Newcastle and Sydney, the safety of people crossing these tracks needs careful consideration. 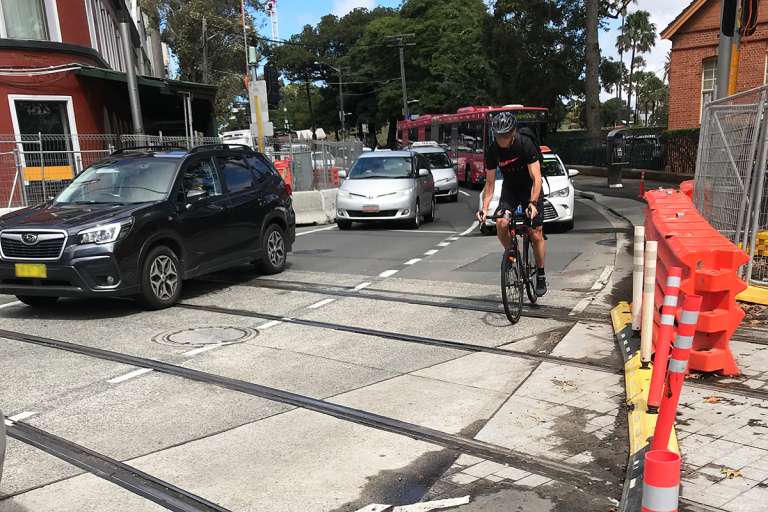 Light rail crossing points have not been common features of the NSW road environment, but the Newcastle and Sydney Metro, along with the upcoming Parramatta Light Rail means more people need to deal with the hazards posed by crossing tracks. A recent video filmed in Knoxville, Tennessee, clearly shows high rates of crashes on a road built with track crossings. This particular road does not easily enable bikes to cross the tracks at right angles, in this case around a 45°. Similar risks could also arise for people using wheelchairs or mobility assistance devices. The accompanying research paper showed that wet weather, riding in a group, and being female contributed to greater crash rates. Approaching tracks at angles greater than 30° dramatically reduced crash rates, and at angles of 60° virtually eliminates crashes. Below is the NSW sign that will appear around track crossings. We hope all track crossings will be signed given most people in NSW are unlikely to have had practice crossing light rail tracks. It is not clear why females were found to be at higher risk than males, but it may be that smaller, lighter riders are at greater risk, so women, children and parents with child passengers may need to take extra care.